The nose of this wine is very pure, with cool dark berry fruit aromas with plenty of garrigue. The palate reveals more concentrated blackberry flavours complemented by fresh rosemary and thyme. 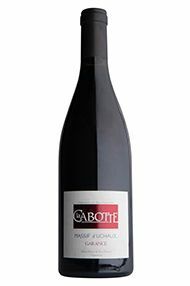 The abundant tannins are well-managed, fine and ripe, framed by Cabotte’s signature elegant acidity which makes its wines both refined and digeste. This is one for the dinner table. Drink now to 2023. This unique cuvee is made entirely from Clairette, spending 10 months in old oak barrels – not to impart oak flavours, but rather to allow micro-oxygenation which stabilises the wine and allows it to develop additional complexity. The resulting wine has a very mineral nose, with herbs and a hint of camomile. The palate starts gently with more mineral notes, but builds to very pure stone and citrus fruit notes, all in balance with the crisp acidity. Drink now to 2022.